Learn more about the rich history of the first recognized college in Florida. The only remaining structure from Rollins' founding, Pinehurst Cottage currently serves as a co-ed residence hall, though the facility has had various uses over the years, including serving as a library, chemistry lab, and infirmary. 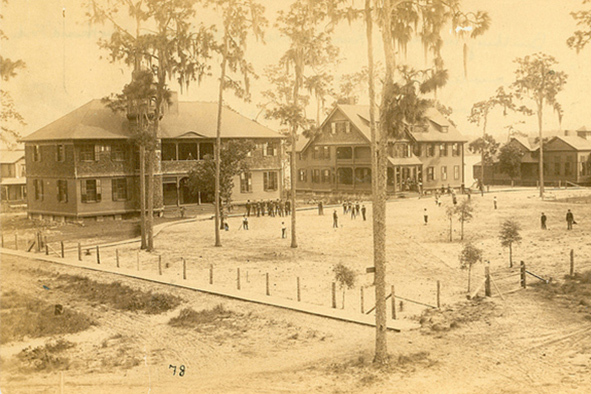 One afternoon in 1880, Lucy Cross had a vision: a college in Central Florida. Five years later, Rollins became the first college in the area, and is now the oldest recognized college in the state. Since that day over a hundred years ago when Cross transformed her vision into a reality, we have aspired to empower our students to see a vision of how the world could be and to provide them with the tools to effect the change they envision. Rollins is founded as coeducational institution of higher learning by the Congregational Church. Classes officially begin November 4. Rollins’ first graduates, Ida May Missildine and Clara Louise Guild, receive bachelor’s degrees. Rollins publishes the first issue of the College’s student newspaper, The Sandspur, making it the oldest continuously published college newspaper in Florida. President Hamilton Holt and Professor of Books Edwin Oswald Grover launch the Animated Magazine, which allows contributors to present their ideas, stories, and anecdotes in person. Each issue supported the Rollins curriculum and allowed students to see and hear the people whose works they were studying in class. Annie Russell Theatre and Knowles Memorial Chapel are dedicated; the Annie Russell Theatre stages its first play, Robert Browning’s In a Balcony, starring actress Annie Russell. Rollins commemorates the 250th anniversary of the birth of Johann Sebastian Bach with a vespers service of his works, thus launching the annual Bach Festival. Rollins launches student radio station, 91.5 WPRK. Fox Day is established by Rollins' 10th president, Hugh McKean. Institute of General Studies is founded. Named the School of Continuing Education in 1973, the program was renamed the Hamilton Holt School in 1987. Roy E. Crummer gives $1 million for School of Finance & Business Administration in order “to strengthen the human element in business;” groundbreaking occurs for Roy E. Crummer Hall in 1965; AACSB International—The Association to Advance Collegiate Schools of Business awards accreditation to the College in 1985. The first African-American students graduate from Rollins. Rollins is one of six original schools in the Sunshine State Conference. Rollins adopts an Upward Bound program, which enables high school students from low-income families or families in which neither parent holds a bachelor’s degree to succeed in their precollege performance. Olin Library is dedicated; the Historic Preservation Commission of Winter Park designates Pinehurst Cottage a historic landmark; Rollins celebrates its 100th anniversary. Alumnus Donald Cram ’41 is awarded a Nobel Prize for chemistry. Rita Bornstein is named the 13th president of Rollins College and its first woman president. Rollins dedicates the first Habitat for Humanity house sponsored by a Florida college. Knowles Memorial Chapel is named to National Register of Historic Places; in 1998, the Annie Russell Theatre is also listed. Rollins launches the Student-Faculty Collaborative Scholarship Program. The program enables students and faculty to work together to develop unique research or scholarship in the faculty member’s field. Rollins launches the Office of Community Engagement, as a way of connecting and engaging students in service, civic engagement, and activism. President Lewis M. Duncan becomes the 14th president of Rollins College; Winter With the Writers, a festival of the literary arts, returns to Rollins. U.S. News & World Report ranks Rollins #1 in the South, a position Rollins continues to hold. Maya Angelou, Francis Fukuyama, and Salman Rushdie headline Rollins Colloquy, which convenes thought leaders to discuss the future of a liberal arts education. Rollins launches the Winter Park Institute, a forum for engaging today’s thought leaders in substantive dialogue with the Rollins community. Rollins initiates The Rollins Plan, an innovative, interdisciplinary approach to general education curriculum. Rollins celebrates 125 years as an institution of higher learning. Grant H. Cornwell Named 15th President of Rollins College. Neighborhood liberal arts system is created in honor of Mr. Rogers. In the spring, every student longs to hear those three words. They signal an excuse to go to the beach instead of classes. And when the president places the beloved statue on Mills Lawn, you’re sure to hear shouts of “It’s Fox Day!”—starting as early as 5 a.m. In 2005, Rollins embarked on an unparalleled effort to internationalize its faculty, giving faculty the opportunity to travel the world to experience other cultures. Since its inception, faculty members have traveled to destinations in Africa, Asia, South America, and Antarctica.